1. TIME TO CROSS OUT ‘PARTY ON A BOAT’ OFF YOUR BUCKET LIST! – This isn’t just another boring old cruise where you sit down and watch the ocean while waiting for time to pass by. It’s called party boat for a reason! 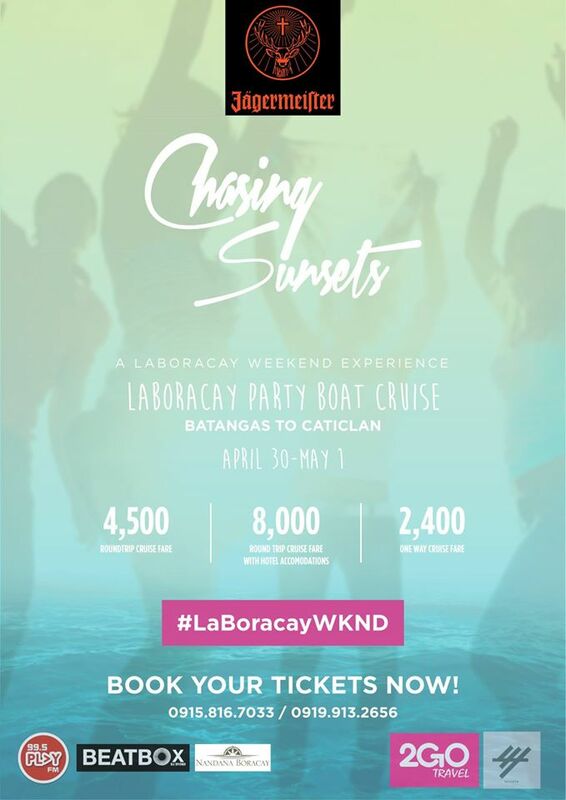 Join in on the fun at the LaBoracay 2Go Party Boat this April 30 to May 1, 9 PM to 6 AM from Batangas all the way to Caticlan. You must be wondering, “what’s gonna happen on the boat while we’re on the way to Bora?” Well, dear reader, here’s what’s up: you’ll be entertained by the DJ’s riding on the boat with you (refer to #4), your favorite alcoholic beverages are on board, and you’ll be surrounded by people who are as excited as you to just get to Bora and party the stress away! So take my advice: make some friends while you’re on the cruise. The more friends, the merrier! 2. 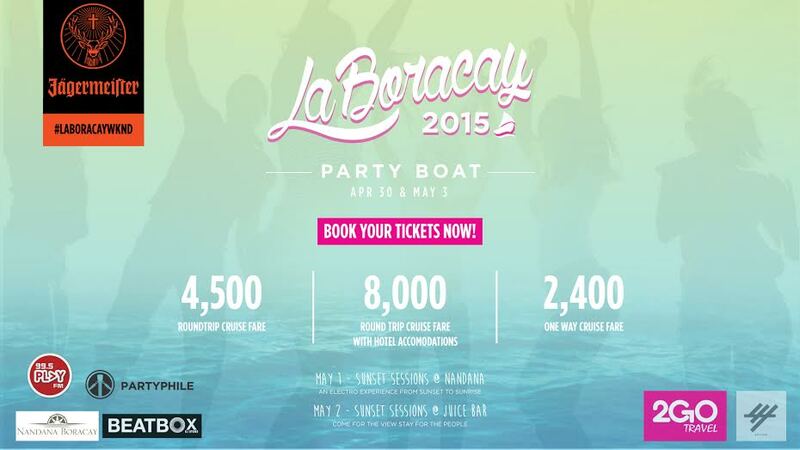 THERE’S A PARTY AS SOON AS YOU LAND IN BORACAY! – Did you think you’d have to wait until later that night just to party? There’s no need! Experience Chasing Sunsets at the roof deck of Nandana Boracay on May 1, 2015, 4 PM onwards. Let’s pretend that the party boat was your pre-game and Chasing Sunsets is the actual party. 3. MISSED OUT ON ‘CHASING SUNSETS’? DON’T WORRY, THERE’S PART 2! – You weren’t able to attend Chasing Sunsets yesterday? Too tired? Too drunk? Both? Well no need to worry because there’s another one happening at Juice Bar on May 2, 2015, 3 PM onwards. 4. A PARTY ISN’T COMPLETE WITHOUT BEATS FROM MANILA’S HOTTEST DJ’S! – Party to the sets of Jeano Zamora, Edleen Lim, Callum David, Katsy Lee, Nico Ylanan, Gruppo Tribale, Arnel Castillo, Clyde Harris, Steph Moreno, Regina Reinoso, and Kim Cruz. Listen to some preview tracks below! 5. FREE SHOTS TO ALL PARTYPHILE APP USERS IF YOU’RE IN THE PARTY BOAT! Joining the contest doesn’t require math or any of those minor-pero-feeling-major subjects you’re studying or you studied back in college. Just follow these easy steps! Lastly, don’t forget to make your Instagram account public so we could see your entry. 🙂 See you there, Partyphiles!